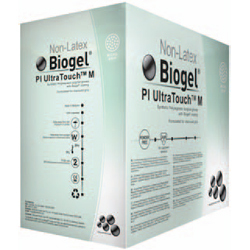 On April 1, 2010, Molnlycke Health Care launched the Biogel PI UltraTouch M surgical glove along with the Biogel PI UltraTouch G surgical glove. Similar to its sister glove, the Biogel PI Ultratouch M feels like it has higher sensitivity because it is 15 percent thinner than the original Biogel polyisoprene (PI) surgical glove. Molnlycke introduced a specialized manufacturing process for this polyisoprene surgical glove to give this textured glove better grip and control. Unlike the PI UltraTouch G version, the Biogel PI UltraTouch M glove has a straight finger design making it recommended for general surgical procedures in addition to gynecological and ENT surgeries. As with all Biogel gloves, these new polyisoprene gloves have a donning agent making them easier to wear even if the hands are damp.